Winter Storm warning was issued for both storms. Total snowfall from both storms was an astounding 23 inches (10in from storm #1 and 13in from storm #2), which is a record for the Toledo area in such a short time span. The second storm also brought bone chilling cold afterwards. The temperature fell to -15 degrees on the 6th. That combined with winds gusting up to 50mph brought the wind chill to near -50 degrees. This storm also brought some thundersnow. Level 3 snow emerganices were issued for 4 days straight in some counties along with many schools off for 5 days due to the snow, cold, and ice. Slight risk for severe for the lower half of Ohio. There were 3 watches issued during the day. One tornado watch (#14) for extreme SW Ohio and two Severe thunderstorm watches (#18 & #20) for NW & Central Ohio later in the night. Our chase area being it was a night event was going to be close to home. No severe weather was predicted even though a watch was issued due to the snow cover. We decided to stay home and monitor the rest of the state. 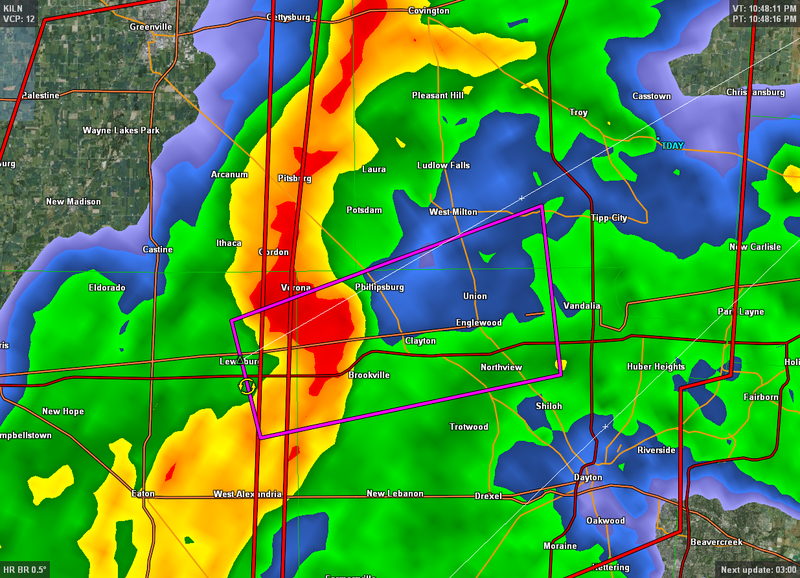 Several warnings, some tornado, was issued for central and southwest Ohio. Many damage reports came in. NWS confirmed 2 touchdowns. 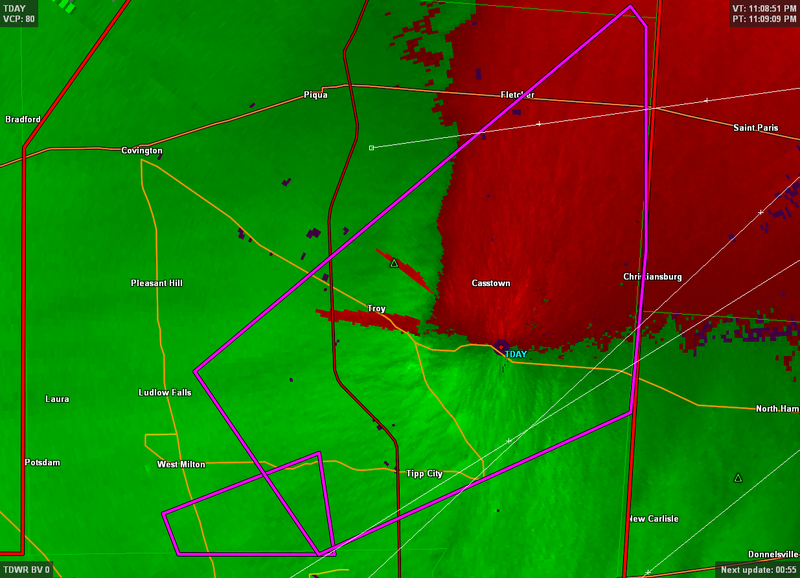 One in Montgomery county and one in Delaware County, both EF-0. Slight risk for severe covered all of Ohio today where we had a 2% risk for tornadoes. Eventually a few severe thunderstorm warnings was issued. There was little to no warnings issued for NW Ohio. The storms that did go warned did not look to severe and we did not go out to chase. A line of storms did from from a line from Mansfield to Cincinnati. Most of the damage reports that came in were wind related. We did have a non-severe storm go over the house. We did film it and got several good lighting shots. A pretty good stay at home chase. A surprise line of storms came through the area, prompting several thunderstorm warnings. No severe reports came in, although it did produce a impressive lighting display. Total rainfall from this storm was 0.46 inches. A no risk day, just a general risk for severe. A line did from in Indiana and approached our area. The forecast called for small hail and some thunderstorm warnings were posted. We observed the storm while we were at a pizza restaurant. Winds did gust up to 40mph. After the storm went thru, we were treated with a double rainbow! Most of the area reported the same as well. Interesting day. SPC originally had NW Ohio under a slight risk for severe. Later in the day they dropped the slight risk for some reason. Still, storms did pop up. 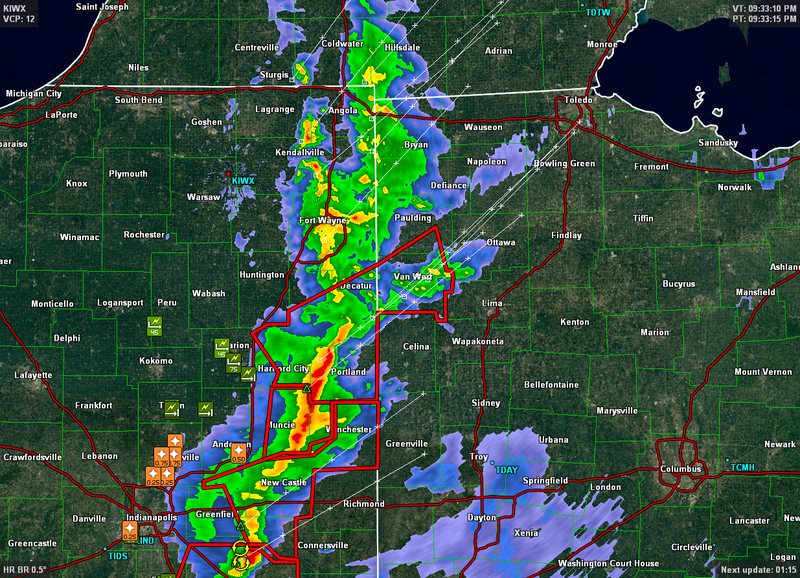 The were even severe enough to issue a few tornado warnings in Monore County Michigan. We targeted some storms along the MI/OH border for a test run of our equipment. 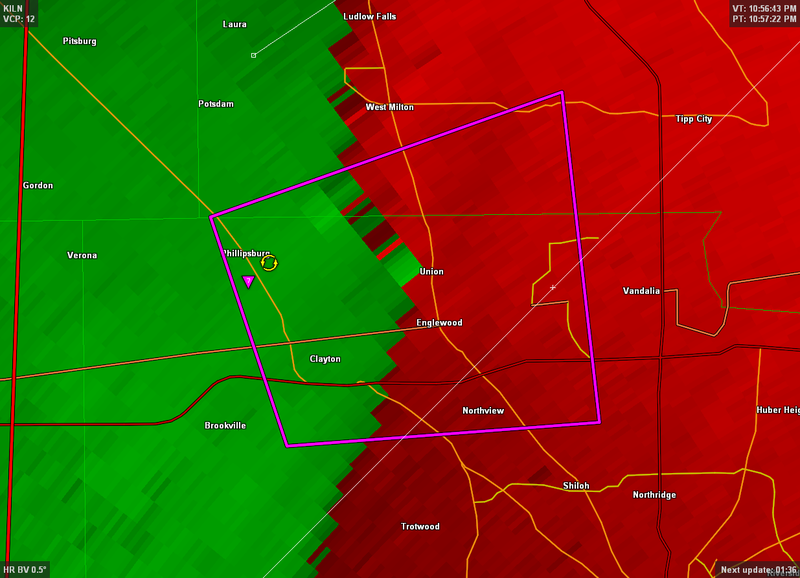 On a few velocity scans, weak rotation was observed. We did see some small rotation in the storm, but nothing produced. The storms quickly weaken and some others pulsed up as we headed home. Some good pics and video was taken. Day two of the test chase day. Slight risk for all of Ohio today. Storms once again were scattered. We headed out to Fulton county and target some storms. The storm did go thunderstorm warned. We had a good bead on the storm until we had some car problems. We had to abandoned the storm which was only producing below severe cirtera. Some damage pics and video was taken. If the car didn't suffered an injury, we would had many more pics. Still a good test day. Came across a strong storm in Winterset, IA. We set up a our cameras and recorded the shelf cloud. It was amazing. As the cloud passed, winds increased up to 50mph and heavy rain was starting. Since we were on a dirt road, we turned around and headed out. We saw some good CG, but thats about it. Still, good structure and great little storm in Iowa. After viewing some sites in South Dakota, we came across a developing thunderstorm in Reliance, SD. We stopped, shot some video and pics, and headed west towards the Badlands. The storm later did go severe, but no damage reports came in.